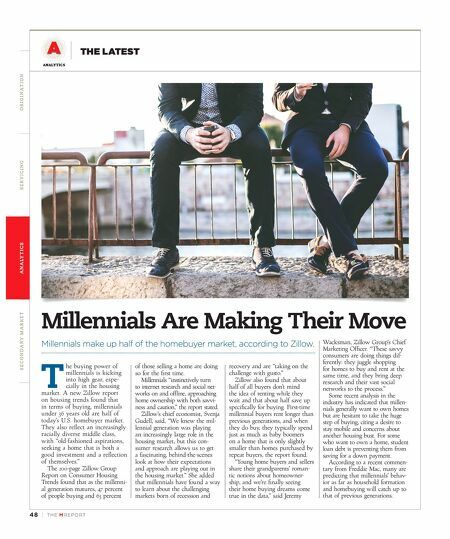 48 | TH E M R EP O RT O R I G I NAT I O N S E R V I C I N G A NA LY T I C S S E C O N DA R Y M A R K E T ANALYTICS THE LATEST Millennials Are Making Their Move Millennials make up half of the homebuyer market, according to Zillow. 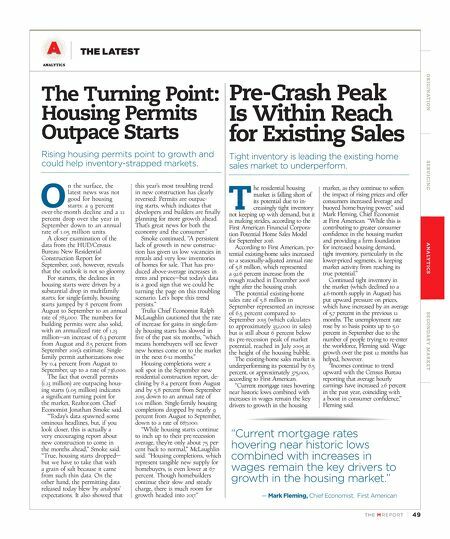 T he buying power of millennials is kicking into high gear, espe- cially in the housing market. A new Zillow report on housing trends found that in terms of buying, millennials under 36 years old are half of today's U.S. homebuyer market. They also reflect an increasingly racially diverse middle class, with "old-fashioned aspirations, seeking a home that is both a good investment and a reflection of themselves." The 200-page Zillow Group Report on Consumer Housing Trends found that as the millenni - al generation matures, 47 percent of people buying and 63 percent of those selling a home are doing so for the first time. Millennials "instinctively turn to internet research and social net - works on and offline, approaching home ownership with both savvi- ness and caution," the report stated. Zillow's chief economist, Svenja Gudell, said, "We knew the mil- lennial generation was playing an increasingly large role in the housing market, but this con- sumer research allows us to get a fascinating, behind-the-scenes look at how their expectations and approach are playing out in the housing market." She added that millennials have found a way to learn about the challenging markets born of recession and recovery and are "taking on the challenge with gusto." Zillow also found that about half of all buyers don't mind the idea of renting while they wait and that about half save up specifically for buying. First-time millennial buyers rent longer than previous generations, and when they do buy, they typically spend just as much as baby boomers on a home that is only slightly smaller than homes purchased by repeat buyers, the report found. "Young home buyers and sellers share their grandparents' roman - tic notions about homeowner- ship, and we're finally seeing their home buying dreams come true in the data," said Jeremy Wacksman, Zillow Group's Chief Marketing Officer. "These savvy consumers are doing things dif - ferently: they juggle shopping for homes to buy and rent at the same time, and they bring deep research and their vast social networks to the process." Some recent analysis in the industry has indicated that millen - nials generally want to own homes but are hesitant to take the huge step of buying, citing a desire to stay mobile and concerns about another housing bust. For some who want to own a home, student loan debt is preventing them from saving for a down payment. According to a recent commen - tary from Freddie Mac, many are predicting that millennials' behav- ior as far as household formation and homebuying will catch up to that of previous generations.